You won't believe your eyes! See the revolutionary CRISS ANGEL Believe from Cirque du Soleil today! Are you ready? Believe features OVER 40 of the most spectacular illusions ever performed – more than any other magic show in the world! Criss Angel is the most watched magician in history of the Internet with over 200 million views on you tube alone. Criss' one clip – "Walk on Water" - has garnered over 45 million views; more than David Blaine, David Copperfield, Siegfried & Roy, and Penn & Teller's most viewed clips combined. Criss Angel performed for an estimated 50,000+ people in Clearwater, Florida - the largest live audience in magic's history, rivaling even Houdini. Criss Angel has OVER 5.5 million likes/followers between Facebook and Twitter alone - more than any magician in internet history. Criss Angel is a Los Angeles Times "Best Selling Author"
Q: How long is the CRISS ANGEL® Believe™ show? A: CRISS ANGEL Believe is 90 minutes long, not including an intermission. Q: Is CRISS ANGEL® Believe™ appropriate for children? A: Due to the show’s production and language content, CRISS ANGEL® Believe™ may not be suitable for children under 12 years of age. Parental supervision is recommended. Q: Does CRISS ANGEL® Believe™ feature any special effects? A: CRISS ANGEL® Believe™ special effects include the use of smoke, strobe lighting, pyrotechnics, birds, intense music and ringing noises. Q: Does CRISS ANGEL® Believe™ tour different cities? A: CRISS ANGEL® Believe™ is a permanent show at a fixed location, and therefore does not tour. Believe was created for the Luxor in Las Vegas and is performed in a theater built specifically for the show. Q: When did CRISS ANGEL® Believe™ have its world premiere? 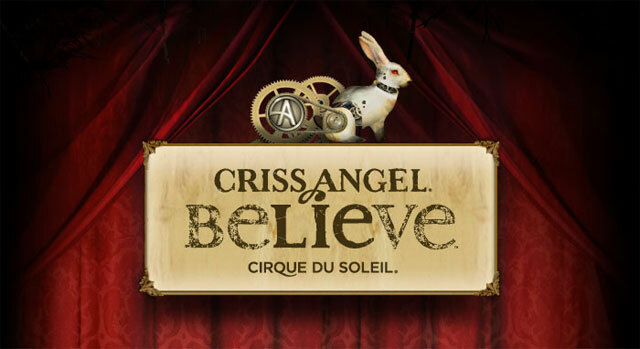 A: CRISS ANGEL® Believe™ has been performing at the Luxor since October 2008. Q: How far in advance may I purchase tickets for CRISS ANGEL® Believe™? A: Tickets for CRISS ANGEL® Believe™ may be reserved up to four months in advance of a performance.